When kidneys are healthy, they clean the blood. They also make hormones that keep the bones strong and the blood healthy. When kidneys fail, people need treatment to replace the work the kidneys used to do. Unless people have a kidney transplant, they will need a treatment called dialysis. There are two main types of dialysis: hemodialysis and peritoneal dialysis. Hemodialysis is the most common way to treat advanced, permanent kidney failure. The procedure can help patient carry on an active life despite failing kidneys. 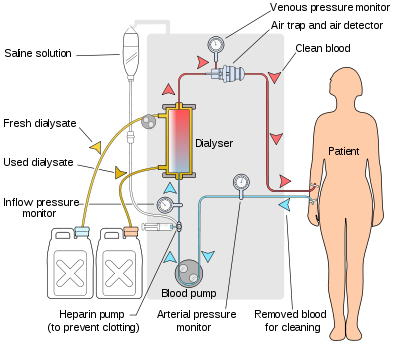 In hemodialysis, a machine filters wastes, salts and fluid from the patient’s blood when its kidneys are no longer healthy enough to do this work. The blood is allowed to flow through a special filter that removes wastes and extra fluids. The clean blood is then returned to the body. Removing the harmful wastes and extra salt and fluids helps control the blood pressure and keep the proper balance of chemicals like potassium and sodium in the body. ensure accurate blood flow through the dialyzer for optimal dialysis therapy. MEMSCAP transducers are currently designed in in multiple hemodialysis equipments. Our transducers combine the required accuracy and long term stability, and sustain most of the aggressive sterilization processes performed in these equipements and medical procedures.